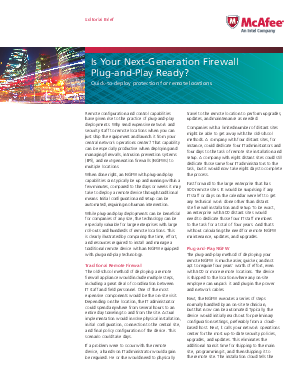 > Research Library > McAfee > Is Your Next-Generation Firewall Plug-and-Play Ready? Remote configuration and control capabilities have given rise to the practice of plug-and-play deployments. Why send expensive network and security staff to remote locations when you can just ship the equipment and launch it from your central network operations center? That capability can be especially productive when deploying and managing firewalls, intrusion prevention systems (IPS), and next-generation firewalls (NGFWs) to multiple locations. When done right, an NGFW with plug-and-play capabilities can typically be up and running within a few minutes, compared to the days or weeks it may take to deploy a remote device through traditional means. Initial configuration and setup can be automated, requiring no human intervention.